The life of a secret agent is tough. We know from James Bond’s biographical movies about the large number of people who to kill you while megalomaniac villains try to either kill everyone, enslave everyone or just take everyone’s money. But those movies gloss over the hardest part of the job: keeping track of who is who, and who they are working for. You think it’s easy, working with a bunch of double agents who all look the same because they wear stupid hats and trench coats and only meet in dark corners, anyway? Well, think again after you accidentally pass that briefcase to the wrong guy. He looked just like the right guy, but when he said “Thank you” you realized he was talking with the wrong stereotypical villain accent. But no more! With Undercover Doris and Daniel Danzer will help you understand just how hard the secret agent life is on your memory. Undercover plays in the late 1960s, at the height of the Cold War. The players control agents from six different countries, all trying to collect valuable intelligence by arranging meetings between agents. But the meetings you arrange can end awkwardly, because everyone in Undercover is a double agent. Who might you be working for? If you want to assign a simple label to Undercover, it’s not wrong to call it a tile laying game. That’s not all it is, but we have to start somewhere. You arrange meetings between agents by picking up an agent tile and placing it next to one or more others. 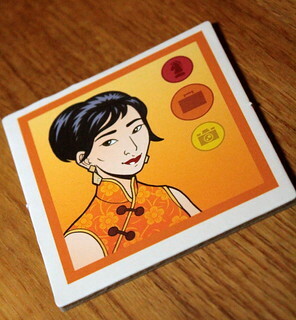 At first, you pick up tiles from the draw pile. Later you can also take agents already on the table and reassign them somewhere else. But meetings only work between agents of friendly agencies. In Undercover, that means you can only place tiles next to other tiles of their own color, or next to tiles with a neighboring color. A yellow tile can go next to other yellows, oranges and greens. 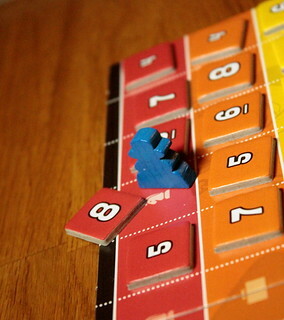 For each tile involved in the meeting, you advance one step on the score track in the tile’s color. That doesn’t mean you score points, it’s not quite so simple, but more on that in a moment. When you arrange a meeting, it pays to remember who else your people are working for. Before you put a tile on the board you have the option to turn it from its official side to its undercover side, or the other way around. A tile that you turned over makes you move two steps on the score track instead of one. That’s cool, but obviously there has to be a downside. And there is. Once you turn a tile, there is no going back. You have to keep it turned and place it with its new color up. And if that wasn’t the color that you expected… well, tough. I told you keeping track of who is who is the hardest part of being a secret agent. But at least you know that the reverse of an agent tile will be one of the neighboring colors of the one you can see, and that each possible combination only exists once. So if your memory isn’t all it’s cracked up to be anymore, deduction can help. The other advantage of turning tiles is that it may give you tiles you wouldn’t otherwise be able to pick up. Players cannot pick up tiles in the color opposite to their own on the color wheel. That is especially vexing because points you earn in this color count double. What you can do, though, is pick up a tile in one of the colors adjacent to that one, and turn it over. That way you may place it, and you still walk two steps on the score track for that meeting. Arranging meetings is only half the game, though. In the end, what you really want is to score points. You already know that there is a separate score track for each color and how to advance on it. But how does that translate into points? Quite interestingly, as it turns out. The first half of the score track is empty, so you need a running start to even get to the points. And then the points are not printed on the rest of the track. There are point tiles for each color and they go on the track in random order. On each track, you take the first such tile that you reach, and then your counter stops there. Only scoring the first tile you reach creates some interesting decisions for you. On tracks where the high numbers come first, you will want to move quickly. On tracks where the low numbers come first, things are not so clear-cut. It’s tempting to wait for other players to collect the low numbers and pick up the high ones yourself. 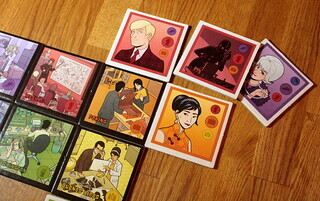 But the game ends as soon as one players has score tiles in all six colors, and six low tiles still win over two high ones and then waiting. Undercover is one of those games where learning the rules takes approximately a minute, but that aren’t that easy to play well. To my great relief, memory not being what it was when I was a kid, memorizing what is on the back of each tile while they keep moving around is not as essential as I thought at first. Sure, remembering who is who on their day job is helpful, and the better you can do it higher you will score. But as often as not you can substitute your deduction skills for memory. If you can see two undercover yellow agents already, then that orange agent over there can’t possibly be yellow on the undercover side. The thing you have to realize about Undercover is that the main action doesn’t happen with the agent tiles. The scoreboard in this game is not just where you count points, it is where your strategy happens. You don’t just go looking where on the playing field you can set up the largest meeting. You figure out in which colors you want to advance, be it to get to the points or to not lose your connection to the other players’ counters, and then you find a large meeting in those colors. Once you wrap your head around that, the pieces of the game just click into place. Undercover is not a complex game, but you need to pay attention, to your own strategy just as much as to what the other players do. Thankfully, it’s a quick game, so you don’t have time to forget everything you knew while the other players take their turns. It’s a great mix of strategy on the scoreboard and tactics in the tile placement with the memory and/or deduction component. A lot of fun to play and easily accessible for everyone. And I mean everyone, in this case. Many games are still problematic for people with color vision issues, but Undercover sets a great example there by always using colors and symbols together. Even with full color blindness you should be able to play with no trouble.